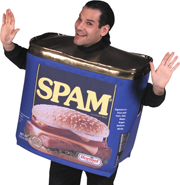 Comment spam, also known as blogspam, has existed since the dawn of blogs. It's created for one purpose: to insert a link on your site back to the commenter’s website. Comment spammers are getting craftier at the game. Comment spam was a much larger problem for bloggers in the nascent days of blogging before improved spam blockers, when you could easily spend 10 minutes a day moderating a blog. Matt Mullenweg, the creator of WordPress, actually created a spam blocker for WordPress called Akismet in 2005, partially so his mom wouldn’t be assaulted by Viagra ads while writing her blog. Today, spam blockers do a good job of nabbing most spam, but link builders still employ underhanded tricks to get their comments onto your blog, usually hiring people to do the deed since bots are usually stopped by the spam blockers. Many business owners and employees are unfamiliar with comment spam; they happily approve spam all the time, and who can blame them? They just don’t know. Here are a few ways to tell if that comment is spam or from a real person, and eight tips for reducing it on your website. First, keep in mind that many of the comments on your blog are going to be spam. Humans will get around your spam blocker and try to leave comments that include the website addresses they are promoting. If you approach editing comments with this in mind, you’ll catch a lot more spam. All comments should be considered guilty until proven innocent. Unless a comment requires a posted link to a valid website to make a point, delete any links in the comment or just delete the comment entirely. This will thwart the spammer’s goal: getting a link back to their site. Sure, you don’t have time to read over every single comment in your queue word for word. But you can eliminate comments that have nothing to do with the blog topic, that contain tons of links, or are extremely vague. There is usually a field for the commenter’s URL in the comment queue. Look at it. If it's a link to a commercial site rather than a personal blog, unless it obviously belongs to the blogger, delete it but leave the comment if it is relevant. If the commenter’s name is gibberish, delete the comment. Don’t approve that comment just because it looks like it was written by a human, or even if they’ve confirmed their humanity through a step in your spam blocker. The best link builders will employ real people who will look for related sites to leave comments on. How do I know? I’ve been one, and that’s exactly what I did. Would I do it again? No way. I still feel dirty from it. PageRank is a key Google technology that defines the importance of a website by the pages that link to it as well as other criteria. While the relevance of PageRank has been debated in the search engine optimization (SEO) community, Google still uses it, as do spammers. If you have a Google PageRank of 3 or higher, you’re going to get comment spam. Anything under this PageRank is less attractive to a spammer, as it is not given as much weight in Google’s results as pages with a higher ranking. To check your page rank for free, go here and type in the address of your website. A shortened URL is an internet address that’s been shortened using a shortening service, such as LinkedIn, Google, Bit.ly, or TinyURL. If a shortened URL doesn’t look like it comes from such a legitimate source, delete it. Spammers are setting up their own URL shortening services to get around having internet addresses deleted in posts. Here, spammers hawk purses and Costa Rican underwear 'investments' on a blog post about eco-friendly jewelry. You’ll spend a lot more time moderating comments if you don’t have a decent comment spam blocker installed on your blog. The better comment spam blockers for business cost money, but if you’ve spent any amount of time trying to moderate comments, you’ll understand how much time and money one of these tools can save you. If you have your blog on a free service like Blogger or TypePad, you are probably already enjoying a free spam blocking service. If you are offered a different level of spam blocking with any spam blocking service, it’s best to choose the maximum with a commitment to go in once a week to rescue legitimate comments. This will save you the most time and at the worst tie up some good comments for a couple of days. Akismet is not free for commercial use, but it is cheap. A Pro subscription for a small commercial website or blog will only set you back $5.00 a month. An Enterprise subscription is for mulitiple sites, and it’s $50.00 a month. While Akismet is one of the better tools on the market, you will still need to go into the spam queue once in a while to fish out legitimate comments. Akismet isn’t just for Wordpress either. It works with Ruby on Rails, Python, various iterations of PHP, multiple versions of .Net, and other platforms you can find here. If you want an in-depth description of the history of comment and blog spam and how Akismet deals with it, check out the video here. If you are operating at an enterprise or developer level, CommentLuv Premium may be a better-priced alternative to Akismet, with a one-time cost rather than a subscription. Angela West is a former link builder who does penance by fixing computers for needy people, like her family members. She's written for big insurance companies, small wildlife control businesses, gourmet food chains, and more. Follow her on Twitter at @angelawest and Facebook.